Antonio de Bellis, The Liberation of St. Peter. 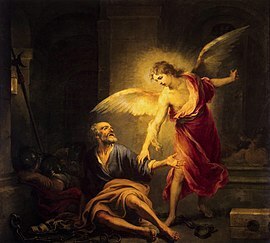 The Liberation of Saint Peter is an event described in the Acts of the Apostles, chapter 12 in which Saint Peter is rescued from prison by an angel. Although described in a short textual passage, the tale has given rise to theological discussions and has been the subject of a number of artworks. Acts 12:3–19 says that Peter was put into prison by King Herod, but the night before his trial an angel appeared to him, and told him to leave. Peter's chains fell off, and he followed the angel out of prison, thinking it was a vision (verse 9). The prison doors opened of their own accord, and the angel led Peter into the city. When the angel suddenly left him, Peter came to himself and returned to the house of Mary, the mother of John Mark. A servant girl called Rhoda came to answer the door, and when she heard Peter's voice she was so overjoyed that she rushed to tell the others, and forgot to open the door for Peter (verse 14). Eventually Peter is let in and describes "how the Lord had brought him out of prison" (verse 17). When his escape is discovered, Herod orders the guards put to death. F. F. Bruce argues that "direct divine intervention is strongly indicated" in this narrative. He contrasts the story of Peter to that of James, who was reported in verse 2 as having been executed by Herod, and notes that why "James should die while Peter should escape" is a "mystery of divine providence." James B. Jordan suggests that this incident is portrayed as being a type of resurrection for Peter. Noting that one of the major themes of the Book of Acts is that "Christ's servants follow in His footsteps," Jordan argues that the events of the chapter "recapitulate the resurrection of Jesus." Amy-Jill Levine and Marianne Blickenstaff, like Jordan, relate the disbelief of Rhoda's message to Luke 24:1–12, where most of the disciples refuse to believe the news of the resurrection brought by a group of women. 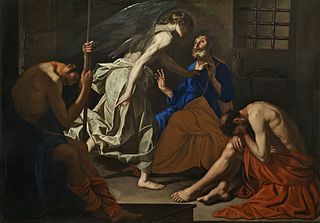 The Deliverance of St. Peter from Prison (1642) is in the Gemäldegalerie Alte Meister. The Chapel Royal of St. Peter ad Vincula, the parish church of the Tower of London. A number of churches are named after "St Peter in Chains" (Latin St Peter ad Vincula, Italian San Pietro in Vincoli), including in Rome (which claims to house the very chains that fell from Peter's hands), in Pisa, in London, Birżebbuġa (Malta), Tollard Royal (UK) and in Cincinnati. The relic of the Chains of St. Peter were kept in Jerusalem, where they were venerated by Christian pilgrims. In the fourth century, the Patriarch of Jerusalem, St. Juvenal, presented them to Eudocia, wife of Emperor Theodosius the Younger, and she took them to Constantinople. Later, Eudocia sent a portion of the chains to Rome with her daughter Licinia Eudoxia, the wife of Valentinian III. Licinia Eudoxia built the church of S. Petrus ad Vincula on the Esquiline Hill to house the relic. Also in Rome was the relic of the chains with which Peter was bound when he was imprisoned by Nero. These latter chains were placed in the same church as the chains from Jerusalem. vouchsafe, we pray thee; to deliver us from the bonds of our sins, and of thy mercy preserve us from all evil. It was included in the pre-1962 General Calendar of the Roman Rite (see the Tridentine Calendar, the General Roman Calendar as in 1954 and the General Roman Calendar of Pope Pius XII). Traditional Roman Catholics continue to celebrate the feast day of "St Peter's Chains" either as a Greater-Double or a Double Major feast. In the Orthodox Church this feast is celebrated on January 16. ^ F. F. Bruce, Commentary on the Book of the Acts (Grand Rapids: Eerdmans, 1964), 251. ^ James B. Jordan, The Resurrection of Peter and the Coming of the Kingdom, Biblical Horizons 34. ^ Amy-Jill Levine and Marianne Blickenstaff , A Feminist Companion to the Acts of the Apostles, Continuum, 2004, ISBN 0-8264-6252-9, p. 103. ^ Webley, Kayla (Apr 19, 2010). "The Chains of St. Peter". Time.com. Retrieved 20 December 2013. ^ Liturgy for 1 August, www.breviary.net Archived 2010-12-16 at the Wayback Machine. ^ Blair Gilmer Meeks, Expecting the Unexpected: An Advent Devotional Guide (Upper Room Books, 2006), 38. Wikimedia Commons has media related to St. Peter Being Freed from Prison.